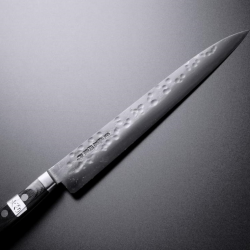 "Sujihiki" or Slicer (Carving knife depending on the purpose) has narrower and longer blade. The Sujihiki is suitable design for the slicing tasks. If you often cut and slice (fillet) fishes, meats, hams etc, Sujihiki is the best choice for your needs. It can also be used for cutting sashimi (raw fish). Originally Sujihiki knife is designed for cutting and removing the muscles from the meats. Sujibiki knifeKnife Shape: SujibikiBlade Length: 240mmBlacksmith: Teruyasu Fujiwara..
Sujibiki knifeKnife Shape: SujibikiBlade Length: 300mmBlacksmith: Teruyasu Fujiwara..